LISBON HIGH SCHOOL TRACK GROUND BREAKING - HISTORIC MOMENT IN LISBON! Members of the Lisbon Community joined Superintendent Richard Green and members of the School Committee during an early morning Ground Breaking Ceremony at the campus located at 2 Sugg Drive In Lisbon Falls. 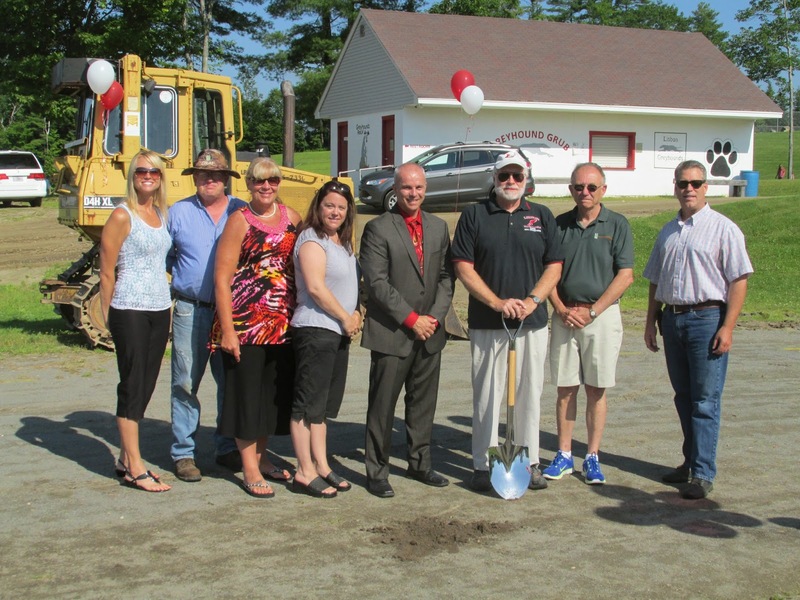 Pictured (l-r): Lisbon School Committee members, Marcey Croskill, George Caron, Kathi Yergin, and Traci Austin; Superintendent Richard Green; Track Coach, Dean Hall; owner of Maine Tennis and Track, John Cornish; and Lisbon High School alumni and representative from Labbe Construction, Bob Walton. Photo courtesy of Monica Millhime. Lisbon - The morning of July 14, 2014, marked a historical moment for the citizens and school community of Lisbon, Maine. Richard Green, the Superintendent of Schools for the school department, greeted a small group of guests for a ceremony to begin a long awaited construction project to renovate the Lisbon School Department’s track and field. Guests who attended the ceremony included the Lisbon School Committee, school department employees, students, and members of the public. John Cornish, the owner of Maine Tennis and Track and Bob Walton, a Lisbon High School graduate and representative from Labbe Construction were both present. Members of the administrative team and central office support were thanked as they worked quietly behind the scenes to make sure that the track process continues to move forward. Richard Green noted that there were many citizens in the community who were not “quiet” throughout the early stages of the track project and bond referendum. Many people worked to make sure everyone was aware of the importance of the track project and for this he showed gratitude on behalf of the school department. Superintendent Green acknowledged two individuals in particular who were very involved and vocal. Dean Willey, a parent, has been actively involved over the last year and managed to fund and organize a private campaign to support this renovation project. Secondly, Coach Dean Hall, who has called the track home for many years, was involved with the track campaign since its inception. Many young lives have been impacted as a result of Mr. Hall’s influence and there was probably nobody more anxious than him to get this project started. Knowing how long Coach Hall waited for this day, Superintendent Green passed the ceremonial shovel to him to break ground. The ceremonial shovel and sample of soil will be placed on display in the new Lisbon High School gymnasium that is scheduled to begin construction in the next few months. FMI on future developments and Lisbon school projects and other activities visit Community Resource News in Lisbon Schools on FaceBook and www.lisbonschoolsme.org.